The Wey & Arun Canal is used to seeing visiting kayakers, but none like Dan Smith. 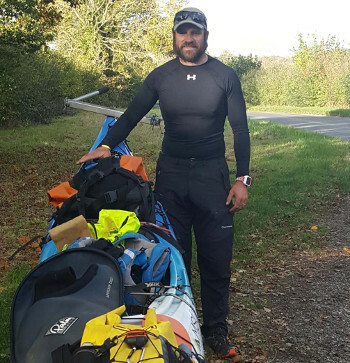 The Army veteran was on a charity fundraising mission to kayak and walk the length of Britain in just 60 days, and when he reached the canal on Thursday 18th October, the end was in sight. His epic journey not only involved paddling 720 miles of inland waterways but walking 190 miles, carrying his kayak and kit along the way when not in water and, as Dan aimed to be as self-sufficient as possible, camping, eating and sleeping in the wild. A specially-made harness and trolley was constructed to allow Dan to pull the kayak along on wheels when not in the water, a load that weighs in at 75kg. The trip has tested every ounce of Dan’s strength and he admits there were times when he thought of giving up. One of the hardest points was at Rannoch Moor in Scotland, when he had to drag the boat over six miles of bogland and heather and against strong winds. Frequently changing the tyres of his specially-built trolley was also a problem he hadn’t expected, having to keep asking for replacement inner tubes. Dan is expected to reach Littlehampton at 12 noon on Saturday 20th October and is set to raise £14,000 for the Royal British Legion.